There are no photos with those IDs or post 15999 does not have any attached images! Here again the already famous Gastronomic Days of the Emberzau and the Cachopo in the municipality of Caravia, and this year is the fourth edition. It is an appointment that has become an important gap in the regional culinary scene. Menus of 22 euros per person, where you can taste three of the biggest delicacies of the municipality: the emberzaos, the cachopos and, in addition, the frixuelos. 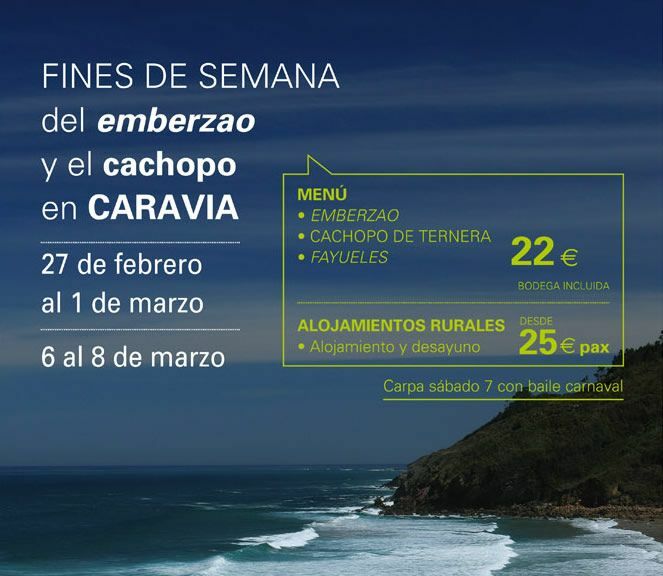 All Caravia restaurants participate in this initiative, which will take place during two weekends in a row, the last of February 27 and 28 of February and 1 of March, and the first of March: days 6, 7 and 8. The initiative also includes accommodation, which will offer visitors offers from 25 euros the night with breakfast included. As a novelty the City Council, to anyone who so wishes and requests one day in advance, will offer a guided tour to the area of ​​La Forquita, a high point that has magnificent views of the coast, from Ribadesella to Lastres. We can taste it in Restaurant Hotel Caravia .